Ready, Set, Go!! 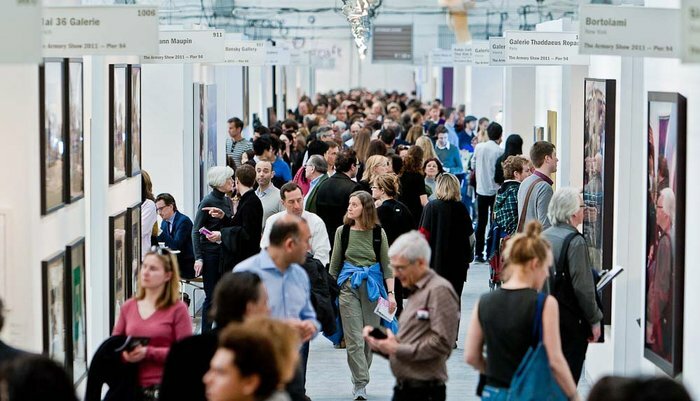 It’s Armory Arts Week, when New York City hosts curators, collectors, critics, and artists from all over the world. Line up at Piers 92 and 94 (at 55th Street) and dive into The Armory Show, one of the best people-watching events all year. Thursday to Saturday, the two piers are open and packed full of modern and contemporary art from Noon to 8pm daily (closing at 7pm on Sunday). And don’t ignore the eleven other art shows going on in Manhattan. Never venture out of your own six-block radius? Now you have an excuse to use your MetroCard. Take advantage of over 75 free public art events in a different neighborhood each night – Tonight (Thursday) is Bronx Day and Soho Night. On Friday, enjoy Long Island City Night; on Saturday, Chelsea Day/Brooklyn Night; on Sunday, the Lower East Side and Downtown. Visit artists studios, check out museums at night, pop in on alternative spaces, listen to podcasts touring subway-station art, and rub shoulders with the peripatetic global art crows. It’s a City-wide celebration! This entry was posted in Art, Museums and tagged art, culture, events, museums by mssusanb. Bookmark the permalink.